In the dying days of 1917, the body of young woman is washed ashore on the west coast of Ireland, near Sligo. She is in an old and decomposing coffin. Before her death, she sent a letter to London, to the poet William Butler Yeats and his Order of the Golden Dawn, foretelling her own death, and asking him to seek out her murderer should it come to pass. A noted spiritualist and supernatural investigator, Yeats charges his young apprentice, the ghost-catcher Charles Adams, with travelling to Sligo to find her ghost, and find out how she met her end. Met by suspicion and loathing, Adams finds himself in a country torn apart by political and religious sectarianism, where the English are less than welcome, and where the supernatural will be the least of his worries. Taking a break from his Inspector Celsius Daly novels, Anthony Quinn takes the reader back to Ireland in the early part of 1918. Europe and much of the rest of the world is at war, but it seems to have little effect on this part of western Ireland – Sligo and its surrounding areas – which is dealing with its own troubles. It is almost two years since the events of the Easter Rising and many of the rich people who call this part of the country their home – ex-patriot Englishmen, for the most part – have been hounded from their manors and estates and sent on their merry way back to whence they came. This is the heart of Irish nationalism, the domain of the Irish Republican Brotherhood and Inghinidhe na hÉireann, the Daughters of Erin. It is into this politically-charged environment that Charles Adams arrives at the behest of his mentor, the great Irish poet W.B. Yeats, an Englishman with no concept of the history of this place, or the current mind-set of the people he is likely to encounter. Charged with finding the ghost of Rosemary O’Grady, it quickly becomes clear that a more natural course of investigation is likely to yield more results. Adams begins asking questions that see him viewed with suspicion by the locals, and brings him into contact with both the local constabulary, and with the Daughters of Erin, in the guise of Yeats’ old lover, Maud Gonne. Adams also finds himself plagued by Wolfe Marley, an Irishman who is employed as a spy by the British Admiralty. Despite the supernatural elements – or the suggestion of supernatural elements – the mystery at the heart of The Blood Dimmed Tide has a wholly natural explanation, something mundane yet very cleverly constructed to allow the user to catch glimpses of the truth as the novel progresses, while still withholding enough to surprise us in the final act. What is most interesting is how each of the two central characters – Yeats and Adams – approach the question of how and why young Rosemary O’Grady died. Yeats, obsessed with the supernatural, has become an investigator of sorts, a debunker of fake mystics and psychics in much the same way that Houdini was. For him, there is no other way to determine the cause of death than by finding and asking the dead girl’s ghost. Adams, on the other hand, takes a more grounded approach, despite his reputation as a ghost-catcher of some talent. For him, the political environment in which he finds himself when he arrives in Sligo raises more questions about the girl’s death and sends him on his inevitable collision course with the locals, and the local powers-that-be. The Blood Dimmed Tide is a wonderful character-driven mystery that is defined in large part by place and time. Nowhere else could the story have taken place than the tumultuous west coast of Ireland in the dying days of the Great War: the environment in which Charles Adams – and, later, W.B. Yeats himself – finds himself, and the atmosphere that Quinn generates for the reader are as important to the story as the murder victim herself. Along our journey, Quinn introduces us to secret occult societies, Irish rebels, the last remnants of the British Empire in Sligo and smugglers. All this plays out as war rages in mainland Europe, and German U-boats lurk off the coastline, an ever-present threat for some, and a potential ally for others. Quinn has done an excellent job evoking the spirit of Ireland in the years following the Easter Rising, and examines the politics of the time by placing an Englishman – and an Englishman with no clue as to what he’s letting himself in for, at that – into the middle of this powder keg of emotions and barely-restrained violence. His characters are well-drawn, his use of the first person allowing us to see inside the mind of young Charles Adams as he undertakes his mission. These sections are interspersed with third-person narratives, which give the reader some insight into the other characters we encounter. The inclusion of Yeats seems superfluous, and indeed he is a character who spends much of the time on the side lines, but it does leave this reader wondering if there are deeper themes at play here, things I might have picked up on had I read any of Yeats’ work in the past (shameful, I know! ), or if he’s just a vehicle to introduce the supernatural aspect of the tale. Either way, it’s interesting to see this side of one of Ireland’s most famous sons. 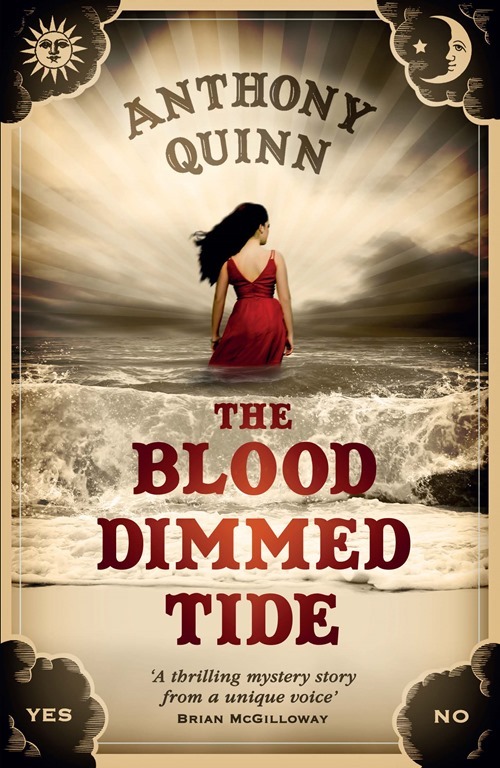 The Blood Dimmed Tide is a dark and gripping tale that takes the reader to Ireland’s very own Wild West. Beautifully written, with a cleverly-constructed mystery at its core, the story blends crime fiction, politics and occultism in a way that keeps the reader interested in every aspect of the story: the political situation as much as Rosemary O’Grady’s cause of death or the insight into the various rebel factions. The book is likely to appeal to fans of Sherlock Holmes, or those interested in the work on the occult carried out by Houdini around the same time period as the novel’s setting, and introduces Anthony Quinn as a fascinating new voice in the latest wave of Irish crime fiction writers, and one that I’ll be watching closely in the future.